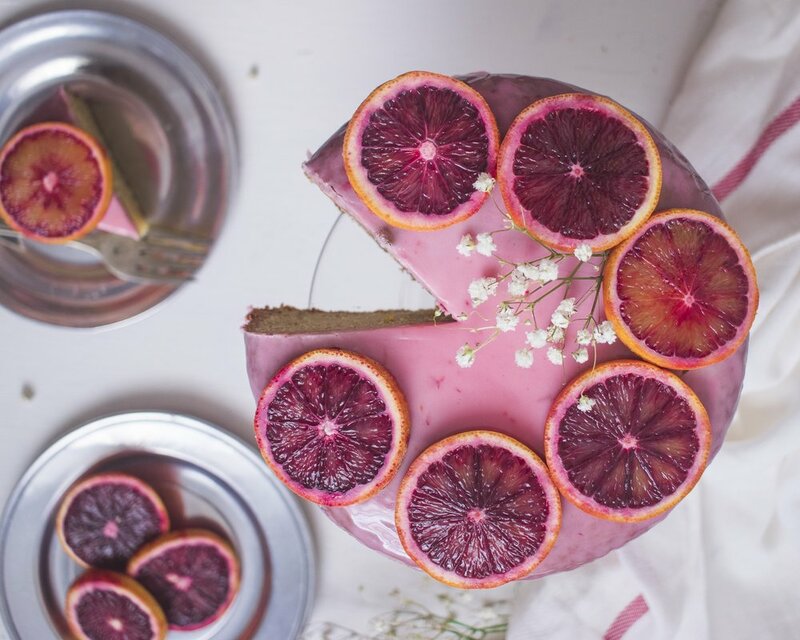 This Blood Orange Cake is one of the best things made this citrus season, apart from the salad, cocktails and tons of jam. Yeah, this year I am totally obsessed with using this beautiful fruit. I am being more conscious and letting the seasonal produce guide me when I am trying to decide what I should make. I usually make a plain sponge cake without any frosting on it, yeah I am one of those people who will be happy with something simple no problem. When I toyed with the idea of making this cake i was going to add blood oranges as a garnish and call it day. But I knew that would not do justice to the cake nor the fruit. So I zested the rinds and added using the juice to add moisture to the batter. Then added some rose syrup for a twist which adds soft wonderful floral notes to the cake. You could make a buttercream frosting, but i chose to keep it light by making a glaze using the fresh blood orange juice. It makes the cake look pretty and adds a delicious tang. Preheat the oven to 350 degrees. Grease and lightly flour a 7-inch cake pan and set aside. Grate 2-3 blood oranges till you have two tablespoons of zest. Add that to a bowl and mix in the sugar with it. Juice two of the zested oranges which should give you 2 tablespoons of juice, add this juice to the bowl with the sugar and zest mix. Add the yoghurt and mix again. Now gently whisk in the eggs and vanilla. In another bowl, sift the flour, baking powder, baking soda and salt. Add the flour mixture into the wet ingredients 1/2 cup at a time and fold in with a spatula till all the lumps are gone. Bake for 40 min, or till the centre comes out clean when tested with a knife or skewer. Cool on a wire rack for 25 mins, unmold and cool to room temperature. Once cooled, top with Blood Orange Icing. Mix in confectioners sugar with blood orange juice and whisk well, pour over the cake and serve.